I was terribly annoyed with myself that I missed the So Sketchy Design Team call. There was just so much going on here at the time of the call. I missed it by only a few hours and the next morning, I wrote to Alli asking that I be allowed to submit late (Puh-lease!! ), hoping that my stint as a Guest Designer might count for something. Early Bird that she is, the team was already chosen and notified! NUTS! She was very sweet in her email and suggested that I play in her challenges each month. So I looked through July’s card sketches so far and found this one. Very unusual. I am also entering this in Verve’s Divine Details Project Parade Contest. “make a project or card that shows us your Divine Details”. I won’t mess around here, I had a dickens of a time getting this layout to work. The diagonal piece was easy (and FUN) but I first tried a large scalloped circle in the darker pink floral paper. Pretty, but the lovely scalloped diagonal paper was lost against the darker pink circle, SCRATCH that. I used some peach chipboard photo corners that came in the scrapbooking kit I was working with, mmm, too heavy looking, SCRATCH that. I tried a circle in the turquoise paper (on the back of cross-stitch paper) for the center, also not right, SCRATCH that. Flowers from the Honey Pie Cosmo Cricket die cut sheet instead of the bows? Not enough contrast, SCRATCH that!! Circle in the middle of the card? Too unbalanced since the diagonal is not in the middle. SCRATCH that. I finally settled on the cross-stitch circle sponged with worn lipstick Distress ink, the cherry blossom paper in the center sponged with cocoa ink, the turquoise reverse of the cross stitch paper as the corners (they fit perfectly on the scrap left from die cutting the scalloped circle!!) and bows instead of flowers on the diagonal. With the circle offset, I needed something for the other corner. This rub-on is so sweet, I know even in the close up it is hard to read, “always cherish every moment with those you love.’” Sweet huh? I wish the small letters showed up a bit better **SIGH** I used pearls to bring more attention to the sentiment and added one to each corner die cut for emphasis. Over all, I am quite pleased with the result and if I were part of the So Sketchy team, I would be proud to send this to Allison. In case I need to list them, my Divine Details are: Die cut photo corners, buttons tied with twine, ‘shabby chic’ ribbon bows, scalloped edges on the circle, pearls as accents and for adding emphasis to the sentiment, sponged paper edges, scalloped edge on diagonal and three different button colours! Just a little note, I ADORE making generic cards. Consider not adding a sentiment to your card (I know!! GASP!! ***) or using a very generic one like an uplifting quote or Thinking of You. Then you always have a card when you need it. You will find most of my cards have no sentiment unless I am making them specifically for someone. Paper: Sassafrass, Honey pie-Cosmo Cricket, Blush CS-SU! 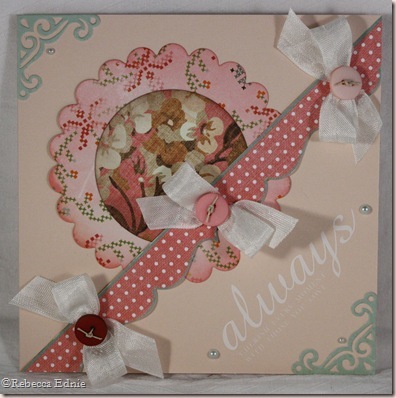 Accessories: corner die-Cuttlebug, scalloped circle Nesties, seam tape-stash, buttons-Maya Road, hemp twine-Hemptique, rub-on-SU! This is just beautiful! I love all your little details. Thanks for playing along in our parade! I like generic cards too! This is beautiful! I love that you used the pearls to bring attention to the sentiment. I don't think I would have ever known you struggled with this one… It's beautiful! I like the soft colors you used, and that layout is fantastic! This is so pretty! I love the buttons on the bows! Beautiful! I love the buttons at the center of the bows! Great job with all of your elements. Stunning work on the verve project challenge. It's a good life!Terri E.
Love everything on the diagonal! 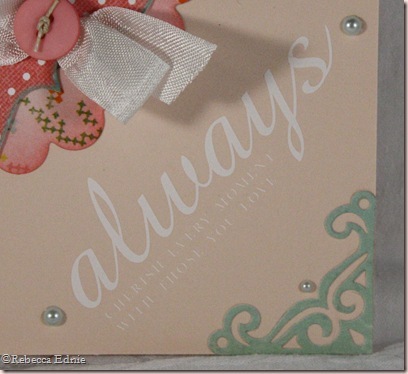 Great card and wonderful embellishments!!! Thanks for joining the challenge at the OCC this week!! !